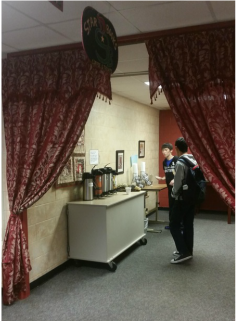 Starbooks is the media center's coffee shop. Every day we brew fresh coffee until 12:30 and also offer hot cocoa (regular and marshmallow), hot cider, and hot tea in a variety of flavors. On Mondays we have candy and donuts, and on Tuesdays we have candy, donuts, and bagels. ​Starbooks opens at 7:40 am and closes at 2:30.